Iran is home to a staggeringly diverse population, with a wide variety of languages and cultures. Due to centuries, if not millennia, of cultural exchanges, intermarriages, and the inherent fluidity of identity in such a pluralistic nation, “ethnicity” does not necessarily hold the same racial baggage that it does in Western cultures, and a family’s self-described ethnicity may change from one generation to the next. 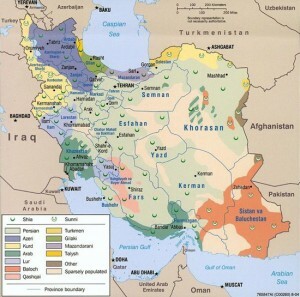 Nevertheless, certain minority cultures in Iran are restricted from publishing in their native languages, and face educational and economic disadvantages. Academics and political figures active in promoting their cultures face arrest, and are occasionally executed. Consequently, many Iranian minorities feel antagonized by the current government and support political causes to increase their cultural rights and representation. The Green Movement and many minority political groups have similar goals, namely to increase popular representation in government, ending media censorship, and open Iranian society for greater internal political dialogue. Additionally, prominent politicians of the Green Movement hail from minority backgrounds as well. Opposition leader Mir Hossein Moussavi is an Iranian Azeri, and grew up speaking Azeri Turkish. Mehdi Karroubi, another prominent opposition leader, is from Lorestan and grew up speaking the Lori dialect. Iran’s minorities first got a taste of a more liberal, open approach to minority rights under President Khatami (served 1997-2005). Khatami pledged to dramatically increase the status of minorities in Iran, taking steps to ensure Kurdish politicians were elected to the national government. However, most of his campaign promises to minority groups were broken, leaving many feeling disenchanted with the possibility of any change coming from Tehran. After the 2005 elections that saw Ahmadinejad’s rise to power, the meager concessions of the Khatami era disappeared utterly. Before the June elections, Karroubi also addressed the question of inequality and ethnicity in an interview with Press TV, an unprecedented act. He said, “First of all, our constitution states clearly that all minorities and all followers of different religions are equal[…]I think that we should have an approach where all people regardless of their gender, religion, or ethnicity can feel that they are part of this government. Nobody else is saying the things that I am saying.” Thus, considering the backgrounds and goals of prominent opposition leaders, and the commonalities of goals between the Greens and some minority groups, the question arises whether or not the Green Movement and minority political groups have, or will, join forces to achieve these common goals. The answer is both a resounding no and a qualified yes --- yes in the sense that many minorities participate in the Green Movement, and no in the sense that the Green Movement’s prominent politicians have no known formal or informal ties with minority political groups. The Green Movement’s most prominent figures have good reason to steer clear of direct contact with minority rights political groups. In Iranian political discourse, many politically active minority groups bear the stigma of ethno-nationalism or separatism. Some Kurdish groups, as well as the Baluchi Jundallah terrorist organization, have used violence for political ends in trying to establish independent regions based on ethnic and religious ties. These ethno-nationalist groups have alienated the Iranian public at large through their use of violence on Iranian civilians, and have made it harder for peaceful minority rights groups to maintain political legitimacy in such a polarized atmosphere. Jundallah, for example, is said to be disliked by most Baluchis for causing economic havoc, murdering locals, and setting back Baluchi political movements by stigmatizing the topic of Baluchi rights, according to the Institute for War and Peace Reporting. In January, the state-controlled news agency IRNA accused the Green Movement of having ties with an armed Kurdish group, the Democratic Party of Iranian Kurdistan. Mostafa Hejri, the leader of the group, issued statements and published an article in January declaring support for the Green Movement’s ideals, according to Kurdish nationalist website Medya News. The accusations from the Iranian government were exactly what the Green Movement has sought to avoid in its attempts to steer clear of extremist elements both in and outside of the movement. Kaveh Ghoreishi of Rooz Online reported a myriad of sentiments amongst a variety of Kurdish groups, comparing their approaches both before and after the election. He found, despite different decisions on precisely what stance to take, all of the Kurdish political groups showed reluctance to become involved with the Green Movement in any tangible way, opting instead for silence, or, at most, a statement of solidarity. The reluctance of political groups to form alliances by no means indicates a dearth of Green Movement supporters amongst minorities. The Guardian’s map of the government’s election results and resulting June 2009 protests, indicates that many major protests occurred in areas inhabited predominantly by ethnic minorities. A similar search on youtube for the names of minority-populated cities and the word “protests” likewise shows no shortage of Green protesters: e.g. Kurdish Orumiyeh, the predominantly Azeri city of Tabriz, and Arab/Persian Ahvaz, among others. The extensive grassroots participation in the Green Movement in minority-dominated areas seems counterintuitive in light of the lack of formal political ties between minorities and Greens. However, this discrepancy may be explained by the awareness amongst minorities that the Green Movement is currently the most powerful vehicle for change in Iranian society, one which lacks the demographic restrictions or political stigma of ethnically-based movements. The realization of the Green Movement’s goals–the enforcement of the constitution, the end of media censorship and the recognition of basic rights of self-expression in Iranian society–by definition includes the goals of many Iranian minority groups for increased self-expression and cultural autonomy. Article 15 of the Iranian Constitution promises the right to one’s native language, while Article 19 prohibits discrimination based on ethnicity, color, or religion. If opposition leaders live up to their pledges to enforce the existing Constitution, the fulfillment of these two basic rights would satisfy many minorities. In recent months, however, minority support in key areas may be waning. InsideIRAN’s Mohammad Khiabani reports that Tabriz, cultural capital of Iranian Azerbaijan and the historically the most rebellious province in Iran, is currently experiencing an economic boom thanks to Turkish investment, and politics is far from anyone’s mind. The IWPR article referenced earlier says that in the wake of the arrest of Jundallah’s leader, Abdulmalik Rigi, the border between Iran and Pakistan in the Sistan-Baluchistan province has reopened, prompting a relative boom in the destitute region’s trade. The government’s recent efforts to politically and economically stabilize minority regions may well prove to be effective in distracting would-be supporters from the Green Movement’s arduous path to reform. thanks for this interesting piece. I would think that it's a general rule that when minorities don't have equal rights within a nation, and don't have special rights like language or some locally decided policies, separatist movements will be more popular. I don't know what other nation would be similar to Iran in this aspect. They seem to have the same 'melting pot' policies of the US, yet without the equal rights. On the other hand, nations like the UK, or Germany have very much more autonomy for regions (are Scots or Welsh considered as 'ethnically' different ??) or 'historically' independant regions. And they seem to work well too. What the Scots and Welsh perceive themselves as today is a little different to what they actually are ethnically . With approx 7000 million on the planet today and another 3000 million expected within 40 years, the whole world will soon be a melting pot. You can expect to see a LOT more cultural, social, ethnic, religious problems right around the world. Actually the Scots are a bit more than just Irish- as I understand it we were a mix of Celts (Scottish and Irish), Pict (possibly 'native' to Scotland? But I think a lot of Picts got wiped out), Scandinavian, Briton (ie Welsh) and Anglo-Saxon (ie English by way of France and Germany) before the idea of 'Scotland' ever existed. The other countries in the UK were a similar mix. But yeah, I'd say the Scottish identity stems more from the idea of nationhood than ethnicity, as emphasised by Robert the Bruce back whenever he was going around uniting the country under his crown. I think most people there don't think of themselves as 'enthnic' as a tightly knit group that has stayed fairly isolated, like some groups in the world. In fact I'm descended from that mix that you say, Normans, Norwegians, basques, Danes, etc... right from Alfred the great and before, (even including 'Duncan', 'murdered by Macbeth' !) Just as you are no doubt. I'm privileged to have seen a very old tree from one side of the family and it has made me think about how we are all descended from very very few people. Who also moved around in prehistoric times according to the climate changes (much more than today LOL). So if people could just think more widely about this, that the term 'ethnic' doesn't really make much sense, its not 'genetic' but cultural, the difference needs sometimes to be emphasized to some of those passionate nationalists typical of comments on youtube when talking of Afghanistan or some other region in conflict. It fascinates me to see the extreme passion of some of those people. I participated in a conversation on one, where a proud Pashtoun announced that he had done a DNA analysis to prove that he was descended by 'x' generations of kings, (so had more validity over Afghanistan), with a Tajik who denounced it saying that they had much more historical presence than his 'family'.. Their typical sexual type of insults (your mother/sister ...), is also quite scary, (for a women), but sometimes they agree to disagree.. and well, it's better to insult each other on the net than with real guns. What folks need is a good education of biology, with clear explanations that the human is a species and there are no races within it. When coranic schools are banned, that might help enormously. didn't see your comment Mike before I posted, you got the right idea. Funny how Tony Blair and Gordon Brown are Scottish origin, if I'm right ? So many Scots got to fame, heh ? As far as I remember, the first courses for Kurdish language were established at the University of Sanandaj already in 2001 (didn't find an English article on that subject). This news was so important, that it featured also on expat news sites, being welcomed by Iranians (whether Kurdish or not) within the country and abroad. At that time I met a Kurdish student in Iran, confirming this news, though I have no information on following developments. As in all totalitarian states recognition of minority rights is met with high obstacles, but once started, the process of their implementation is irreversible. It should also be noted that language issues are in most cases secondary to more immediate problems such as infrastructure in general or health care. but I'm sure you are glad that your distant relative stole that sheep as I saw today that we are still united, we have the same temperature as you 20° ! And they made a super country that although is not in the west, is included when we say 'western' .. funny that, we should change the term. I have never understood why the three (?) countries with Kurds would never let them have their own independant land. It seems so cruel to them. Rubbish. Iran's Supreme Leader is Azeri. Iran's former head of the judiciary is an ethnic Arab.